Prayers for a good fortune for your dear ones and this gift of Lip-Smacking Cadbury Celebration and Haldiram Assorted Sweets with Love will be cherished as the greatest souvenir from you this Raksha Bandhan. Deliver this Haldiram 250 Gms. 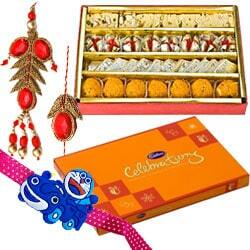 Assorted Sweets with Cadbury Celebration Pack and Bhaiya Bhabhi Rakhi with 1 Kids Rakhi. Deliver this Haldiram 500 Gms. Assorted Sweets with Cadbury Celebration Pack and Bhaiya Bhabhi Rakhi with 2 Kids Rakhi. Deliver this Haldiram 1 Kg. Assorted Sweets with Cadbury Celebration Pack and Bhaiya Bhabhi Rakhi with 4 Kids Rakhi.